The 3D Control Pad, called the Sega Multi Controller (セガマルチコントローラー) in Japan, Samsung Multi Pad (삼성 멀티패드) in South Korea, and the Joystick 3D in Brazil, is a control pad developed for use with the Sega Saturn. Debuting with NiGHTS into Dreams, it was Sega's answer to the then revolutionary Nintendo 64 controller, which featured an analogue stick as opposed to relying solely on D-Pads. Analogue sticks generally allow for greater precision in a 3D environment, which in 1996 were becoming more common in the console video game market. 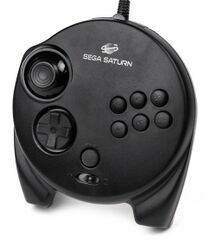 The 3D Control Pad builds on the features already seen in the standard Saturn Control Pad, containing an eight-direcional D-Pad, and , , , , , and face buttons. New to the controller is an analogue thumbstick (or "3D Directional Pad" as Sega called it), positioned on the left hand side of the controller above the D-Pad. Also inlcuded are analogue and shoulder triggers, a first for mainstream video game controllers. To avoid compatibility issues, the analog controller has a switch under the start button to swap between "Digital" and "Analogue" modes. Switching to "Digital" mode disables all analogue settings, essentially turning the controller back into a standard control pad. This switch was vital, because earlier games were not built to understand the analogue technology and will not function correctly if the wrong mode is chosen. The original PlayStation and its latter dual-analogue controllers also required this feature. The lead can also be removed from the controller for storage purposes. The 3D Control Pad did not see widespread adoption for the same reason the Sega Saturn failed to capture a large share of the market in the west. The Saturn's 3D output was low, and as the controllers were never bundled with the console, consumers were more familiar with the standard Saturn control pads. It also has some design issues, namely the fact it is quite a lot bigger than most other controllers and arguably less comfortable than the standard pads for certain genres. Even in Japan, where the Saturn was successful, the controller was not used by many games (many of them coming from Sega, though some developers, such as KID, supported it quite a bit (in their case, even after Sega introduced the Dreamcast)). The 3D Control Pad also works with games compatible with the steering wheel controllers, and the Mission Stick. North American games which support the 3D Control Pad have this icon indicating compatibility on the back of the box. J. League Go Go Goal! The 3D Control Pad takes many of its design cues from the XE-1AP, an analog thumbstick controller previously released for the Sega Mega Drive console in 1989, exclusively in Japan. The 3D Control Pad is one of Sega's most significant video game controllers, with Sega filing a patent covering a number of possible extensions to the designMedia:Patent US7488254.pdf, achieved through the port at the top of the controller. Covered ideas include wireless connections to the console (and light gun-style support)Media:Patent US7488254.pdf, extra joysticksMedia:Patent US7488254.pdf and trackballsMedia:Patent US7488254.pdf, memory cardsMedia:Patent US7488254.pdf, a second displayMedia:Patent US7488254.pdf, clocksMedia:Patent US7488254.pdf, a curious rotatable standMedia:Patent US7488254.pdf and motion controlMedia:Patent US7488254.pdf. Vibration feedback is also consideredMedia:Patent US7488254.pdf which may pre-date attempts by Nintendo. Notably the 3D Control Pad beat the Nintendo 64 to market by a month in the US and several months in Europe, so the Sega Saturn stands as the first video game console to support modern analogue stick support. The 3D Control Pad can be credited for many common features seen in controllers today, with its design greatly influencing that of the Sega Dreamcast Controller. Analogue shoulder buttons have since been adopted by Nintendo, Microsoft and Sony in the Nintendo GameCube, Xbox and PlayStation 3 (and their successors) and the placement of the analogue stick has also been copied by several firms, including Microsoft and Nintendo. Microsoft's Xbox and Xbox 360 controllers in particular borrow a number of design elements from the Dreamcast Controller and Saturn 3D Control Pad. Main article: 3D Control Pad/Magazine articles.